The Record Plant in Los Angeles was the place to be on Sunday nights in 1973, when owner Gary Kellgren convinced drummer Jim Keltner to host a weekly jam session called the Jim Keltner Fan Club Hour—despite Keltner’s distaste for “jamming,” and for the moniker. So many huge artists played and recordings were made, though they never saw the light of day, except for one monumental evening Keltner recalls that was bootlegged for many years and finally released by Mick Jagger on the Very Best of Mick Jagger in 2007. 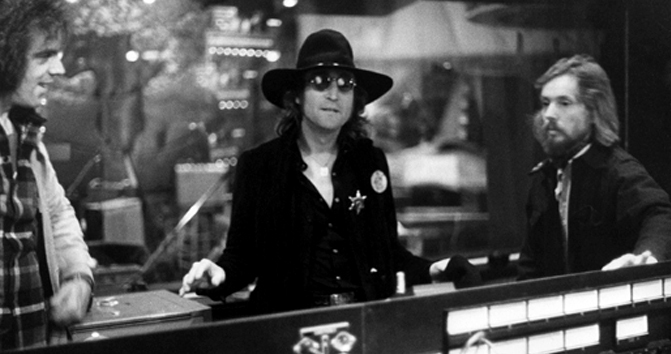 That night Lennon showed up and produced “Too Many Cooks,” which Danny Kortchmar had brought in to the session. Jagger was on vocals, Harry Nilsson on backing vocals, and among the musicians were Kortchmar, Keltner, Jesse Ed Davis, Al Kooper and Jack Bruce. According to Keltner, Ringo was just hanging out that night. Modest as Keltner is, artists came because of his reputation, even that early on, as the Los Angeles music scene was bursting at the seams in such recording studios as the Record Plant, Village Recorders, A&M, Conway, Dawnbreaker, Westlake, United Western, Sound City, Evergreen, Ocean Way, Capitol, Sound Factory, Sunset Sound, Paramount, Larrabee and many, many others. He was one of those musicians who remained at the core as a new wave of faces began to appear on the session scene. © 2019 Record Plant. All rights reserved.